NSGminer is an advanced NeoScrypt CPU and GPU miner with the OpenCL support delivering the best hash rates for the AMD Radeon hardware (HD4000 series and newer). Should be compatible with the latest AMD Catalyst drivers. Also provides limited support for all NVIDIA OpenCL capable GeForce, Quadro and Tesla hardware. No external dependencies other than libcurl. Getwork, GetBlockTemplate and Stratum protocols are supported. –thread-concurrency, --shaders, --vectors are not used for NeoScrypt. --intensity or -I is the primary performance optimiser. May be set between 8 and 20 according to your video card’s memory size. For example, -I 16 means (2 ^ 16) GPU threads each of 32768 bytes = 2,147,483,648 bytes or 2Gb. There are some configuration tweaks available in neoscrypt.cl which might deliver a little bit of additional performance. Yes, it’s cool that Ghostalander is maintaining a GPU miner for Neoscrypt. The speed up must be in the miner code, I tried compiling in the Neoscrypt.cl kernel from it into sgminer and it still gives 75 KHash/s on the R9 270 under Linux. 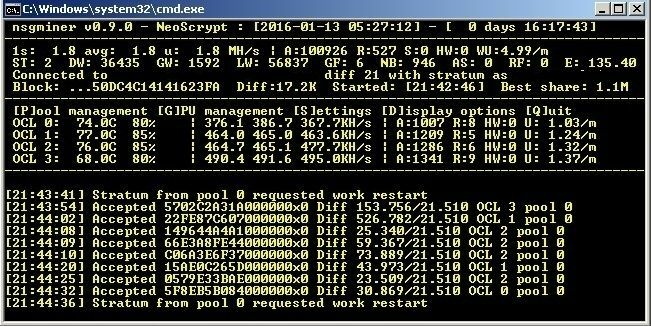 I recall SGminer recommends to use xintensity. It isn’t guaranteed to deliver power of 2 thread numbers which is a must for my kernel. The classic intensity results in (2 ^ intensity) thread numbers which is fine. Are there windows binaries available? @AmDD No, I don’t use Windows. Although I can compile the miner in a VM like anything else, I cannot test the OpenCL part if it works actually. That’s why no binaries at this moment. I normally bounce back and forth between Linux and Windows for mining. Its nice to have the option and I know a number of other users are Windows only. Thanks for the work, @ghostlander ! @ghostlander its crashing on nvidia latest driver, if i load up visual studio to debug, the error is a memory access violation. I’m not aware of any pre-compiled binaries. @SpartanC001 Assume it doesn’t work on NVIDIA. No NVML support compiled in, no compatible OpenCL kernel, no NVIDIA hardware to test anything on my side. nsgminer-win64-0.9.0.zip can not download. where download it ? @FlatBlack “Pool 0 is hiding block contents from us” means an overloaded Stratum pool most likely. BTW, good hash rates. Four R9 290? ur reply at bitcointalk last time, help a lots…!!! below shows around 16 hours running with 3 x R9 290 (ref), 1 x R9 290 Tri X… is d temp. is at normal rate…?